Men of the 605th Machine Gun Company captured at Romani. "Today ..." on 27 July 1916. Then there was no more. It was as though the man recording the diary was ordered to undertake a duty which led to the diary being packed and no further words recorded. What actually happened will always remain a mystery. To follow the general movements of this formation, the entries from the Official History by the Turkish General Staff, Birinci Dunya Harbinde Turk Harbi, IV ncu cilt, 1 nci Kisim Sina Filistin Cephesi, Harbin Baslangicindan Ikinci Gazze Muharebesinin Sonuna Kadar. (Turkish War During WW1, Vol. 4, 1st part, Sinai-palestne Front. From thebeginning of war till the end of 2nd Gazze) 1979, pp. 338- 394, fills in the story till 4 August 1916. These entries are brief and focused in upon the general force rather than specific units. P.340 Last units of Pascha 1 arrived at their positions at the beginning of June 1916. Thus Birinci Kuvvei Seferiye (1st Expeditiornay Force) were able to be ready to the duty. p. 346 On April 11-15th 1916 a reinforced company raided to Jifjafe which was 40 kms away from the Canal and took an Austian Engeneers officer and 33 Turks POW who were opening new water wells. First Group: (right wing) commanded by Col Refet (Gen. Bele) commander of 3rd Div. Units: 31st Inf. Reg., 601st and 604th MG Companies, a mountain battery, a long range 100 mm artillary battery, a 150 mm Howitzer Obus battery, and a company of engeneers. 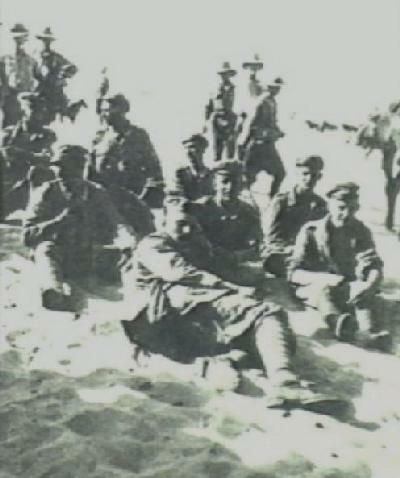 This group moved from Bir el Abd following the coast towards Ogratina. Their Headquarters were established at Hod el Naga. Second Group: (middle line) commanded by Colonel Ibrahim. Units: 32nd Infantry Regiment, 602nd and 605th Machine Gun Companies, a mountain battery, Austrian-Hungarian mountain Howitzer battalion, a company of engeeneers. This group moved from Bir el Abd to Hod el Masya over Hod um Vayhelhilm which was their HQ. Third Group (left wing) commanded by Major Kamil commander of 39th Infantry Regiment. Units: 39th Infantry Regiment, including the 603rd and 606th Machine Gun Companies, a mountain battary, a company of engeneers. This group moved from Bir el Bayud to Bir el Magiebra. Mamaybrua HQ. 4th Group was established as a reserve Regiment built by the 4th battalions of the active service Regiments, along with the 607th and 608th Machine Gun Companies. p. 374 On July 29th 1916 the HQ of the 1st Exp. Forces made the following changes amoung the units. 1st Group: 4th Battalion of the 31st Infantry Regiment, a company of the 2nd Battalion of the 81st Infantry Regtiment, a K u K mountain Howitzer Battalion of the 2nd Group was was placed under the command of the 1st Group. On the other hand, the 3rd Mountain Battery and half of the 2nd Ammunition Company was was placed under the command of the 4th Group. 2nd Group: A team of independent Hecinsüvar (camel raiders) company was was placed under the command of the 4th Group. The KuK Mountain Howitzer Battalion was placed under the command of the 1st Group. The places such as Hod el Mahari, Hod el Masya, Hod el Dakr was given to the responsibility of the 4th Group under command of Major Mayer. The group has to occupy the region until 1800 hours of August 1st. The group was organized to be the reserve of the Expedition. A compny of the 2nd Battalion of the 81st Infantry Regiment was ordered to build a airfield at the north east of Bir el Abd. 608th Machine Gun Company was placed under the command of the 4th Group. p. 384 On August 4th at 1800 very strong force of Allied cavalry attacked from the direction of Duedar turning the left side towards the rear of the 4th group the 39th Infantry Regiment. The Group resisted the attack fiercely but Major Kamil and 500 of his men and the mountain battary were captured and taken as prisoners of war. The Machine Gun Companies resisted until last of their ammunition. They destroyed their guns and reteated to safety. p. 385 On the morning of August 5th, 605th Machine Gun Company and some men of the 32nd Infantry Regiment were captured and taken as prisoners of war. p. 386 At the end totally 850 men of 1st Expeditionary Force were captured and taken as prisoners of war by the Allied Forces. From this description, it is difficult to know exactly where the 605th Machine Gun Company was placed as there were two actions on 5 August 1916 where German machine gunners were captured. We can only read hints through the following reports. 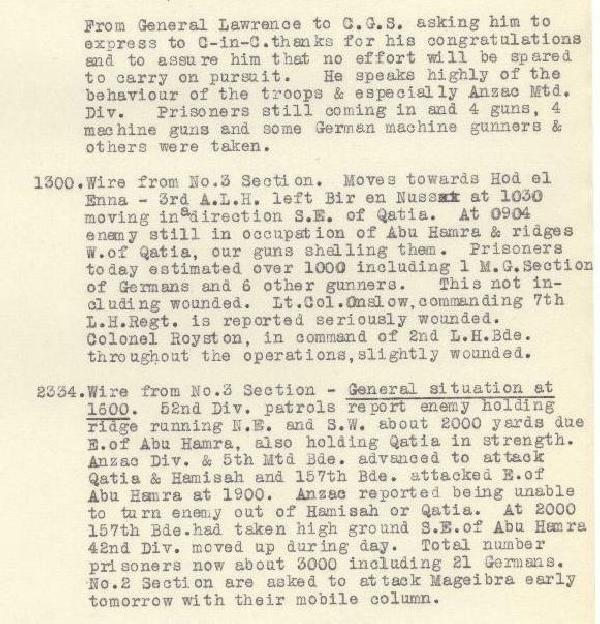 From the War Diary of the General Staff, General Headquarters, Egyptian Expeditionary Force, August 1916. 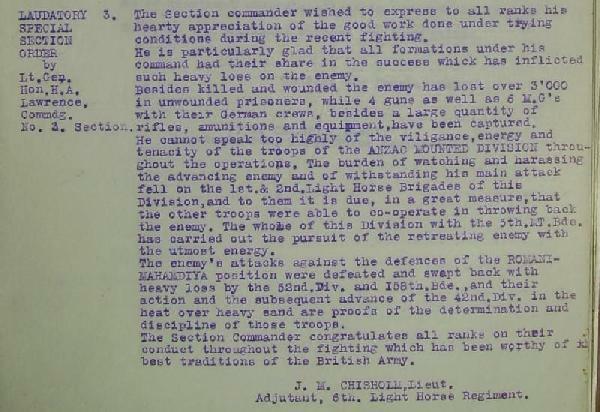 From 6th Australian Light Horse Regiment Routine Order No. 90, 16 August 1916. During the Battle of Romani, at Bir um Ziad, the men from the 2nd Light Horse Brigade captured members of the 605th Machine Gun Company. Along with the machine guns, a number of gun chests were also recovered. An ambulance man, 429 Sgt John Jackson Dunbar from the 2nd Light Horse Field Ambulance opened up one of the chests and discovered the unit's War Diary. Much later on, the War Diary was translated by Major General John Gellibrand. Eventually it found its way by donation to the Australian War Memorial by the good services of Captain RA Perkins from the 2/41st Battalion. Next Page: No further entries.